Origin Eastern United States and to central and eastern Canada. 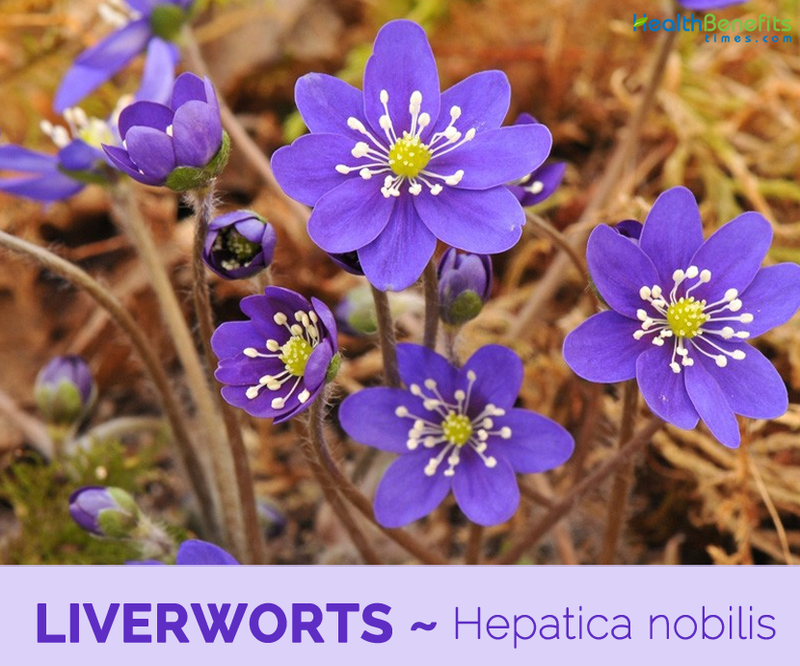 Hepatica nobilis commonly known as Liverworts is an herbaceous perennial in the buttercup family (Ranunculaceae). The plant is native to the eastern United States ranging as far north as Iowa and south to the Florida panhandle and to central and eastern Canada. 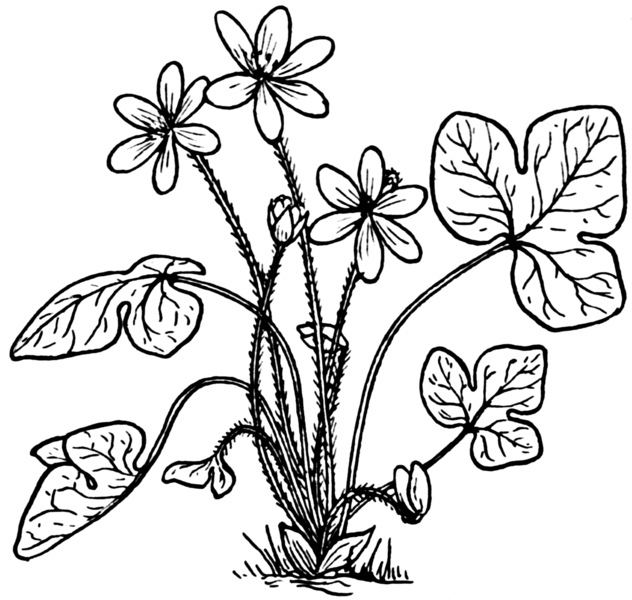 Apart from Liverworts it is also known by several other names such as Hepatica, Sharplobe hepatica, Roundlobe hepatica, herb trinity, kidneywort, liverleaf, liverweed, noble liverwort, round-leaved hepatica and trefoil. Normally a lowland plant, it has been spotted in the Allegheny mountain range. 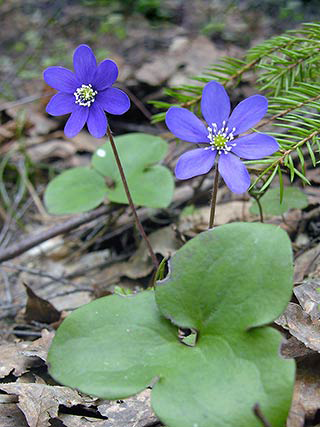 Many variations of the species hepatica exist around the world, including those on the Asian and European continent. At least one variation is indigenous to Japan. Taxonomists continue to argue over liverwort’s standing in relation to these relatives. Liverwort is a deep-rooted and hardy plant. 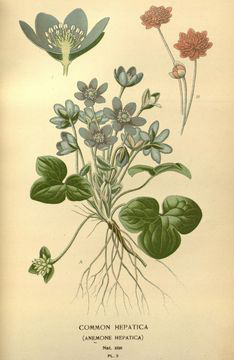 The botanical name of the herb, Hepatica, is believed to have originated from the Greek word hepar, meaning “liver,” as well as the Latin word epatikos, meaning “affecting the liver.” Anemone is also of Greek origin and refers to the wind. 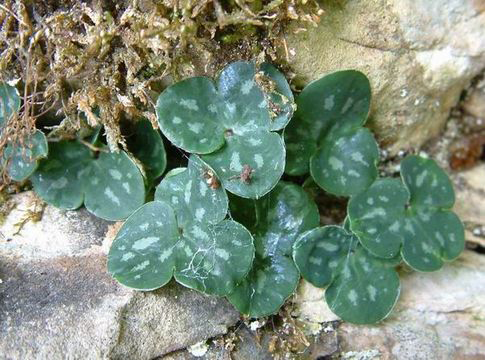 Two of hepatica’s other common names, liverleaf and liverwort, come from the supposed resemblance of the leaves to the human liver, both of which have three lobes. Liverwort is an herbaceous perennial plant that grows about four to six inches (10 – 15 cm) tall. The plant is found growing in damp underground in shady deciduous, usually beech, woodlands, scrub and grassland, especially on limestone. The plant thrives in well-drained soil, but also tolerates damp soil in low-lying areas. Few plants can also tolerate heavy soils. The plant consists of 1–7 hairy stems. Leaves grow up to three inches (8 cm) long and wide. Green leaves have three thick and hairless lobes. Leaves stay green through winter. As the leaves age, they take on a deep burgundy color. Lower surface is hairy underneath and often reddish, upper surface dark green, sometimes with light spots. Flowers are perianth regular (actinomorphic), blue–bluish violet–purplish red (sometimes white, red or flecked), 15–35 mm (0.6–1.4 in.) wide. 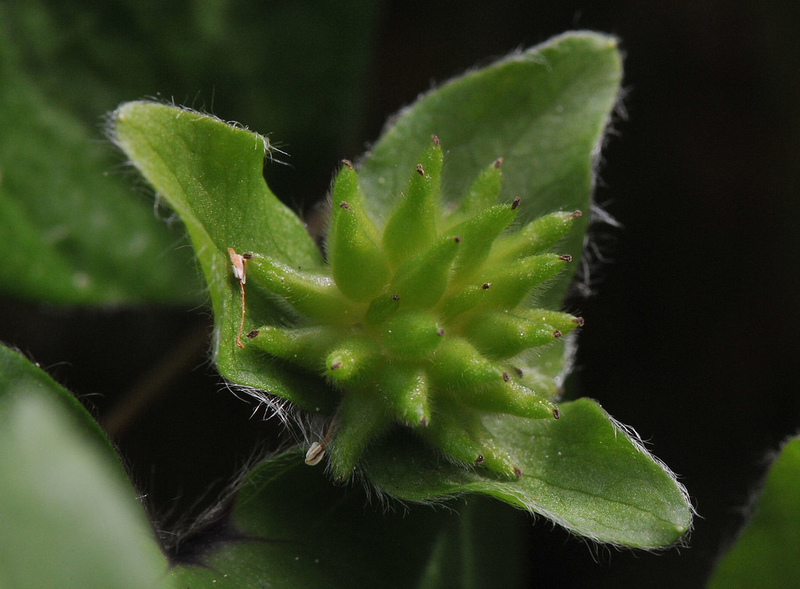 Tepals are about 6–7, outer surface lower part hairy. 3 sepal-like bracts below tepals. Stamens are many, white–light red. Gynoecium separate, with many pistils. Flowers are solitary, terminating scape. Flowering normally occurs from Feb to March. 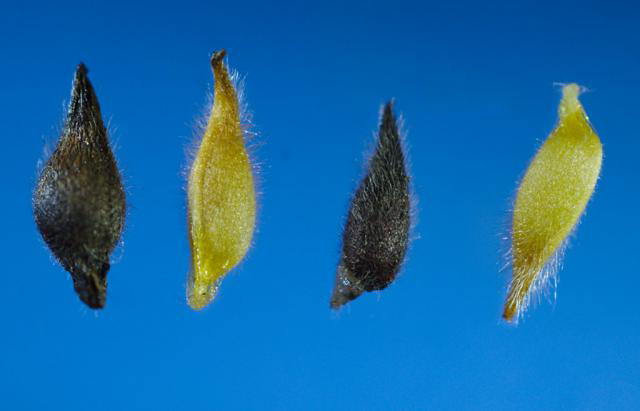 Fruit is a hairy, short-tipped, 4–5 mm (0.16–0.2 in.) long achene, often together. Infructescence is nodding when ripe. The most commonly grown garden forms are derived from H. nobilis a very hardy hepatica found in deciduous woodland throughout Europe, the Balkans, southern Scandinavia and Russia. It even occurs inside the Arctic Circle, so this species is very hardy. The six-petalled flowers come in blue, white or pink and the single-flowered forms often seed around in woodland gardens. Specialists also offer a wide range of hepaticas from other parts of the world. There are twelve species and all grow on woodland slopes where leaf mould gathers. They include some excellent garden plants. The most common hepatica in the wild and the easiest to grow in the garden, with flowers that come in pure white, cobalt blue and vivid pink. The handsome three-lobed foliage, which is sometimes marbled, rarely gets untidy. Flowering usually takes place during March (9-15cm). From central Romania, this larger-flowered hepatica tolerates drier conditions and more shade. Flowering often occurs in February, with blooms consisting of nine or so rounded blue petals with a green middle. It spreads by rhizomes, but not aggressively so. Scalloped leaves are not as pristine as those of H. nobilis (15cm). A pale-blue form raised at Thomas Carlisle’s Loddon Nurseries at Twyford in Buckinghamshire over 50 years ago. Large-flowered sky-blue hybrid bred by Ernest Ballard the husband of hellebore breeder Helen Ballard. Slow to bulk up. This much stronger, blue-flowered hybrid was named ‘Harvington Beauty’ after the Worcestershire village where it was found growing, often in dry conditions. Although no one knows for certain where it came from, Helen Ballard’s daughter once lived in this village so it might be another Ballard hybrid. Hybrids between H. nobilis and H. transsilvanica have larger flowers and neater, glossy green foliage. ‘Millstream Merlin’, a gentian-blue single bred in America, lilac-blue ‘Buis’ and deep-blue ‘Harvington Beauty’ are all excellent (15cm). One of the best garden forms is a large, evergreen hepatica from Korea with green-eyed, ivory-white flowers and hairy jade-green foliage. 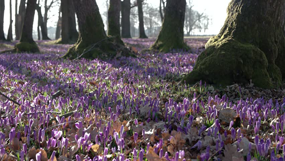 It flowers in February and will grow under deciduous shrubs. The large leaves are thickly textured with fine hairs round the edge so it’s a handsome foliage plant. Since a long time ago hepatica has been recommended for gallstones. Gallstones are formed in the bile either by excess cholesterol or bilirubin and can cause many problems including chronic pain in the shoulders and abdomen area as well as nausea. It is thought that drinking the extract of hepatica in the form of tincture or the cold extract can crush the gallstones in the bile. Frequent consumptions of hepatica, especially in the form of infused water, help to ease the burden pancreases have to carry. Hepatica consists of many chemicals whose functions are to break down carbohydrates, proteins and lipids, such as flavonoids. Not only that, some of the chemical compounds in hepatica is also known to have stimulating properties toward many internal organs, which are mostly related to digestive system. 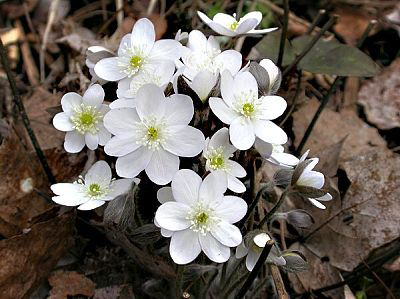 Hepatica has been used by people of old as herbal remedy for liver diseases. There are basically many herbs and even vegetables which are said to improve liver conditions, such as turmeric, ginger, sweet potatoes and raw vegetables in general. Anyway, the practices seemed to go on that people associates hepatica with medicine for liver. 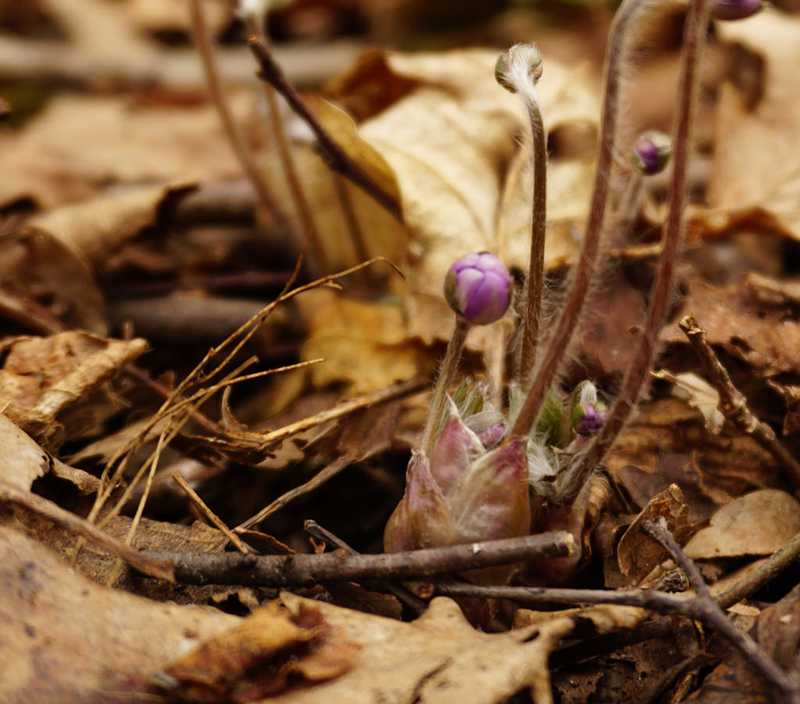 Hepatica’s astringent nature helps to stimulate the contractions in the gastro internal tracts. Thus, the digestion processes are also sped up. Thus, drinking hepatica tea might be considered as alternative treatment for digestion problems such as constipations where the functions of the bowel areas aren’t working quite as it should be. Hepatica is an alternative solution to reduce the cholesterol level in the blood. The methods by which hepatica works seem to stimulate metabolism and cleansing the blood from some harmful substances. Although doesn’t work directly at reducing cholesterol, the presence of hepatica as tonic for liver certainly help the work of liver in breaking down cholesterol. It seems that when it comes to herbal remedies, some of them can be fixes for multiple health problems. Such is the case with hepatica, while its primary use is to cure liver diseases; turns out people have been using it for other purposes too. Being drunk as an herbal drink, hepatica can give mild astringent feeling to the stomach which is supposed to be relaxing and soothing to the stomach. Astringent nature of hepatica makes it possible for hepatica to contracts many involuntary muscles in our bodies. Thus, the extra works which the muscles have to bear will signal the brain to supply more blood. In turn, the brain makes the heart to pump more blood and thus increasing blood circulation. Unfortunately, the method of by which hepatica influencing blood circulation is not really well-documented or even ever documented at all. Due to its mild and relatively safe nature, people are using hepatica as tonic for various purposes. Some use it daily the way they do with tea. 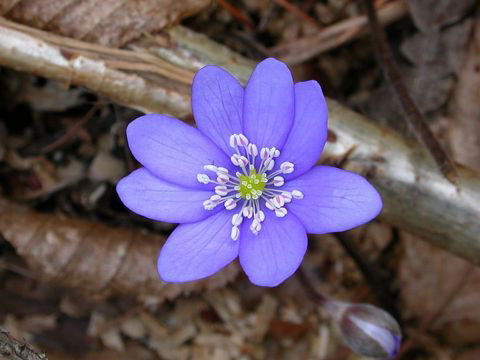 Very little does everyone know why and how it works, but people also use hepatica for appetite stimulants. Some considers the taste to be the cause, as is the case with herbal plants in particular; hepatica’s strong scent might induce enhanced appetite. Liverwort when drunk as a tea, it has all the relaxing and soothing benefits that most of herbal tea does. Flavonoids as well as saponins contents in hepatica work wondrously together as both anti-inflammatory and antioxidative agents. As is the case with some herbs and spices that contain saponins, such as garlics and gingers, hepatica can also help relaxing the tensions in the muscles as well as the nerves. Leaves and flowers are astringent, demulcent, diuretic, rubefacient, tonic and vulnerary. It is a mild remedy that is little used in modern herbalism, but it is sometimes used in treating disorders of the liver and gall bladder, indigestion etc. Externally, it is applied to skin diseases, slow healing cuts etc. Herb was widely used in folk medicine, particularly for the treatment of diseases of the liver and gallbladder. Extracts or decoctions made from the leaves have been used in herbal medicine for the treatment of liver ailments, gallbladder ailments and digestive disorders, and to treat coughing and bronchitis. Herb can be used as a gargle for inflammation of the gums and chronic irritation of the neck and throat. It has also been used as an herbal remedy for kidney and bladder diseases. Herb was once used externally to treat slow healing wounds, minor injuries, ringworm, and sunburn and to get rid of freckles. Liver, Kidney diseases: Add 2 tbsp of dried Hepatica to 2-3 cups of Whiskey. Let it stand for 20-25 days at room temperature. Strain and take 10-12 drops on a sugar cube, thrice a day for liver, kidney diseases. Gallbladder Diseases: Prepare a tincture by using 2 tbsp of dried herbs with ½ quarts of Whiskey. Take 10-15 drops, 3 times daily on a sugar cube. Tea: Hepatica infusion is made from the leaves, and it is used to treat fevers, liver ailments, and constipation. Externally, it is applied as a wash for swollen breasts. Capsules: Liverleaf capsules are available as an antioxidant liver support for humans and pets alike, such as small dogs and cats. It is often mixed with other herbs, such as milk thistle. Liquid extract: A liquid extract of hepatica blended with other herbs is thought to aid and cleanse the liver. Ointment: A liverleaf ointment or salve made from fresh, juiced leaves is believed to accelerate wound healing due to its astringent, antibacterial properties. Tincture: A concentrated solution – made from dried leaves macerated in alcohol and diluted in a glass of water – traditionally aids liver, gallbladder, and kidney function. Plant is poisonous in large doses. Toxic principle is dissipated by heat or drying. Excess use may cause mucosal irritation, vomiting, and stomach ache. Fresh plant may cause irritation on the skin. Severe irritation of the digestive tract follows ingestion of the unprocessed plant. 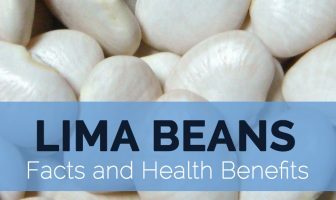 When used internally, it may irritate the kidney, stomach, and urinary tract and also may cause diarrhea. Other side effects that have been reported on an external usage include pus-filled blisters, itches, and irritation. Pregnant and breast-feeding woman is advised not to take liverwort or any other supplement that may contain this ingredient. People suffering from hypercholesterolemia must be extra careful, because it may change lipid levels. Soil Thrives in well-drained soil, but also tolerates damp soil in low-lying areas. Leaf Grow up to three inches (8 cm) long and wide. Green leaves have three thick and hairless lobes. Flower Perianth regular (actinomorphic), blue–bluish violet–purplish red (sometimes white, red or flecked), 15–35 mm (0.6–1.4 in.) wide. Hepatica acutiloba f. albiflora R.Hoffm. Hepatica acutiloba f. rosea R.Hoffm. 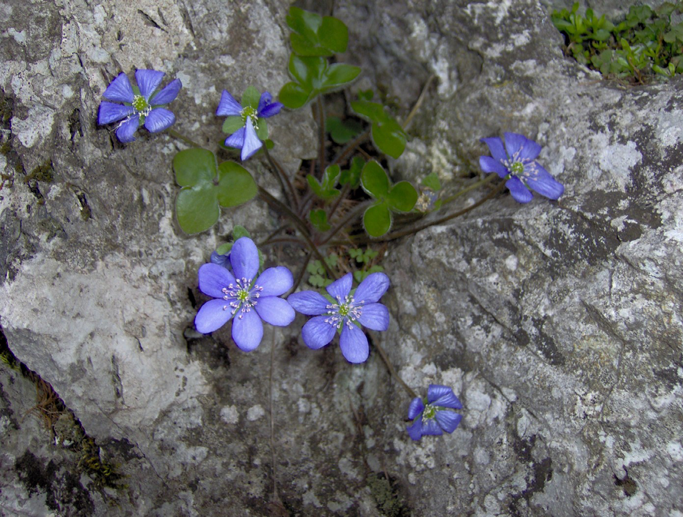 Hepatica acutiloba var. variegata Farw. Hepatica hepatica var. albiflora (R.Hoffm.) Farw. Hepatica hepatica var. vulgaris Farw. Hepatica nobilis f. albiflora (R.Hoffm.) Steyerm. Hepatica nobilis f. plena (Fernald) Steyerm. Hepatica nobilis f. rosea (R.Hoffm.) Steyerm. 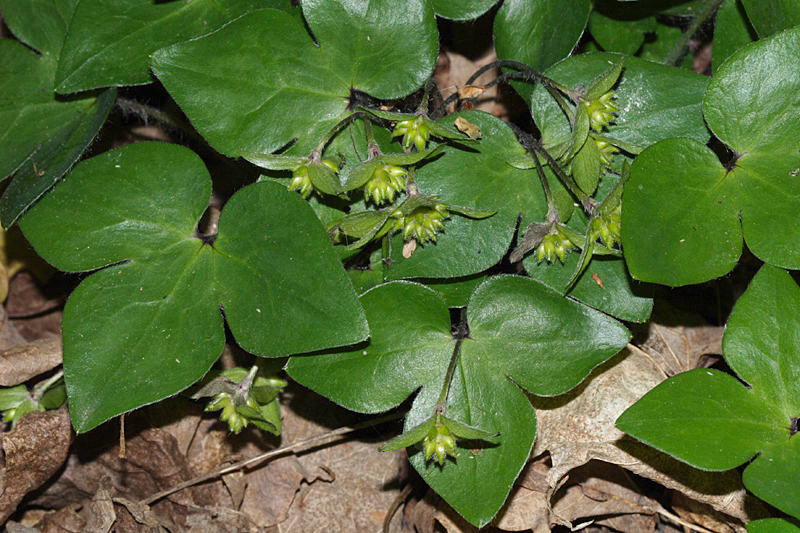 Hepatica triloba var. albiflora Raf. Hepatica triloba var. parviflora Raf.